Meryl Streep as Katharine Graham in THE POST. Photo: Fox. "The arc of history may be long, but women’s memories are longer, and the justice coming is long overdue." There is a revealing shot early on in Steven Spielberg’s delightful historical drama The Post in which Katharine “Kay” Graham, the legendary Washington Post publisher played here by Meryl Streep, a legend of similar stature, steps off an elevator and walks down a hall before entering a meeting with her all-male board. It’s a simple, transitory set-up, but Streep invests a wealth of physical gestures (smoothing down her skirt, clearing her throat, straightening her body, raising her chin up high) within a mere matter of seconds, wearing Graham’s frayed nerves on the outside for all to see. 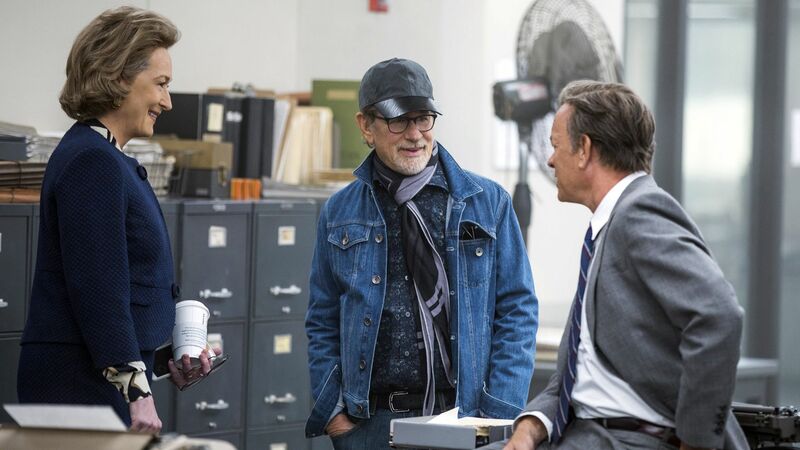 Spielberg's latest chronicles the Post’s controversial publishing of the Pentagon Papers in 1971, a decision, made by Graham, that catapulted her business empire — and the country — into a new and precarious political era at the exact same moment that the publication itself was preparing to go public. In Liz Hannah and Josh Singer’s screenplay, Graham is a D.C. socialite-turned-reluctant leader struggling to find her professional voice and remove herself from the long shadow of men in her life and industry. Spielberg's camera lingers obsessively on all the actors in this extensive and exceptional ensemble, but none more so than Streep, who adds yet another consummately-embodied creation to her extensive, era-spanning gallery of complex screen heroines with something to prove. I spoke with Streep about the process of playing a late luminary, the most underrated film performances of 2017, and the sudden relevancy of The Post’s emphatic portrait of journalistic bravery. The Post definitely feels like a meeting of three screen legends. How did your involvement in this project come about? What did your collaboration with Steven Spielberg and Tom Hanks entail? Did their approaches to either directing or acting bring out new elements in your own approach? I definitely agree that Tom and Steven are screen legends… Honestly I would never had predicted that I would’ve had the chance to work with both of them this late in my life and career. And now, after having worked with these men at the absolute peak of their creative game, I am spoiled and needy and greedy and want to do it again! There were definitely surprises… With Steven I guess I anticipated sort of a fixed and certain way of working, a veteran with his own way of doing things established and inviolable. Instead what I found was a man totally in touch with his youngest, most improvisatory, excited, and collaborative talent. He scooped up ideas and inspiration from everyone. On the day [of a shoot], he made visual and narrative decisions out of the air that other directors might’ve labored on for months with a storyboard. His imagination percolates story in an instinctual, intuitive way. He made a decision on the morning [of the shoot] to isolate Kay coming down the steps of the Supreme Court into a sea of young women, representing the hope for the future. He just sees — and feels — what the film needs at that moment. He edits the film as he goes along, and starts to digest what the film, as it is being born, calls for. It was thrilling to watch. And I was totally unprepared for the force field that is Tom Hanks, the energetic, disciplined, forward-leaning, smart, smart, smart man whose stride is just a half step ahead of everyone else’s. I had to hit the ground prepped and ready; and still had to run to keep up. Yes, yes, yes, he is “the nicest man in Hollywood” — even though we [shot] in White Plains, New York — but he is also one of the most intellectually adept. And probably the most underrated actor of his stature in our profession. How familiar were you with Katharine Graham before you accepted this role? What resources did you rely on to better understand her? I completely relied on her Pulitzer Prize-winning autobiography, Personal History, as my Bible, both the book and the recorded, abridged version, which she reads herself. It captures so vividly her grace and insecurity, her undeniable authority to speak on matters of history because of her placement in it, and her intimate, confiding, and honest assessment of her own shortcomings as she saw them — as a leader, as a wife and mother. It is a spectacular journey through a life lived at a pivotal moment for women, and her emotional and intellectual negotiation through it. I spoke at length with Liz Hylton, her assistant of 30 years, and Evelyn Small, the researcher who worked for 16 years alongside her as she wrote the memoir. I spoke with Sally Quinn, Ben Bradlee’s widow, [as well as] Lally Weymouth, Kay Graham’s daughter, and her son, Don Graham. The interesting thing was where these accounts diverged from each other, and where they all fell in agreement. I soaked it all up and then tried my best to give the essence, if not the exact rendering, of the woman. You share a great deal of screen time with other members of this stellar ensemble, particularly Tracy Letts, Bradley Whitford, Bruce Greenwood, and Alison Brie. What did these actors contribute to the shape of your performance? Tom has said, and I agree, that this group of actors is the sharpest and most formidable ensemble [with whom] we have ever had the pleasure to work. The number of award-winning actors who took the smallest roles just to be able to have a part in telling this story, the truth of which is so pungently applicable today, was so heartening and generous. It is difficult to pick one out… each person really does have [his or her] moment to shine, and they [all] bring hefty talent to telling moments of importance in the film. We needed each and every one to bring their A-game, and they all came through for Steven. Ann Roth, who has obviously been a friend and collaborator of yours for decades, gives Kay some fabulously varied period outfits; I’m thinking in particular about that amazing caftan that you wear during the interrupted retirement party. How does Ann contribute to your discovery of a character? Ann Roth and I have worked together for over 30 years, going back to Silkwood. One of my favorite things is the moment when, in the dressing room at the Costume Depot, her inelegant shambles of a studio, she breaks out the Sancerre and we celebrate the creation of a character, because we have just found the woman in the mirror, in [the] way she presents herself to the world. We speak the same language, Ann and I, which is to say we both know it when we see it, and we, being extremely opinionated women, have never disagreed on that moment of discovery. I take enormous pleasure in having introduced her to Steven, and I know he is as wild about her as I am. I will never forget when you used your platform at the 2011 Golden Globes to praise two of the year’s most underrated performers, Pariah’s Adepero Oduye and Jane Eyre’s Mia Wasikowska. What performances have impressed you this year? This year, two of the finest performances by women were not recognized in many of the awards shows at all, and either of them merited walking away with every prize out there: Annette Bening in Film Stars Don't Die in Liverpool and Cynthia Nixon in A Quiet Passion. Incomparable performances, right up there with the ones that are winning everything. Sometimes momentum trumps everything, and life and show business are never entirely fair. In these increasingly uncertain times, what was the experience like of lending your talents to a project like The Post, which is politically-minded to the point that it often feels in direct dialogue with our current climate? I am so happy that this film in particular speaks to the present moment, on so many issues. [It speaks to] individual courage, [by] Daniel Ellsberg, Neil Sheehan, the New York Times, Ben Bagdikian, Ben Bradlee, the Washington Post, and, of course, Katharine Graham. It speaks to the cost of speaking up, which accrues to journalists and women denied the credibility by powerful men, it speaks to the attempt to subvert the First Amendment by tyrants who mistake the executive [office] for a throne… [It speaks to] all of this in ways we couldn’t have anticipated back in 2016. Amy Pascal bought Liz Hannah’s screenplay six days before the election! She thought she’d make a film which took a nostalgic look back at how far women have come in light of the first female presidency. Suddenly the world was jacked off its axis, and the movie started to feel the wind, the hot air of an inferno at its back, and we were hurtled into our relevancy. As your industry continues to reckon with the many allegations of sexual abuse and overall misconduct that are at last coming to light, how do you think the role of the artist in Hollywood can adapt to ensure that such behavior will not be tolerated? The arc of history may be long, but women’s memories are longer, and the justice coming is long overdue. I don’t think we will go backwards on this one. The inequity in the power dynamic will be felt right through society, and the corrections will be made inevitably. I am extremely optimistic and usually, but not always, right. Ha! The Post is now in theaters.